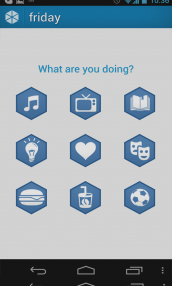 A new app recently debuted at the Google Play store and it has the potential to actually become extremely popular. Stickam.com has introduced an application programming interface (API) that would bring power of live video to anyone that wants to incorporate it into their website or web application. By using the StickamAPI, Web site developers can quickly and easily integrate live video streaming capabilities, including TV-style broadcasts as well as group and one-on-one chat rooms, onto their online destinations. Through its use, web sites can take advantage of the benefits of live video streaming, such as longer visits, enhanced user interaction and, in turn, increased revenues. The StickamAPI alleviates time and money constraints associated with the requirements of live streaming, such as bandwidth, server infrastructure and Flash development, which currently serve as significant roadblocks for companies that do not have the available resources or knowledge to incorporate live streaming onto their site. As advertisers and publishers seek ways to improve performance to compensate for shrinking budgets, new technologies like location-based advertising provide a means of improving relevance and response rates. Real estate site Trulia.com, and media company 1020 Placecast, have announced their partnership, using location information to target specific audiences for advertisers and deliver more relevant messages to them on Trulia.com. Placecast adds a new dimension to audience targeting by using location information as the key to relevance. In Truliaâ€™s case, the starting points are the real estate locations in which users express interest. Placecastâ€™s proprietary targeting algorithms correlate these with dozens of other demographic, psychographic and geographic data points. For publishers in categories such as travel, events, tickets, real estate, weather, classifieds and career search, Placecast uses the location information already present on these sites to target audiences and customize messaging. Improved performance results in a dramatic increase in the value of ad inventory for advertisers, transforming remnant ad space into premium CPM real estate for publishers. One of the first advertisers to take advantage of this approach with Placecast and Trulia is Avis-Budget. Approximately halfway through a three-month campaign, Avis has seen its ads on Trulia perform strongly relative to other publishers. The Avis-Budget campaign is just the first of many in the expanded partnership between Trulia and Placecast. Real estate web site Zillow.com is releasing Zillow Quote API, a new feature within Zillow Mortgage Marketplace that allows participating lenders to automate custom quotes to borrowers who submit loan requests. Made possible through an application programming interface (API), the new automation program will be rolling out in the coming weeks, starting with five technology providers: Leads360, Mortech, Mortgagebot, NYLX and Optimal Blue. Zillow Quote API provides a way for lenders to streamline the process without compromising the customization of the quotes for borrowers. Once a request is submitted by a borrower to the Marketplace, lenders using the API will receive the full set of details the borrower entered in an automated fashion. They will use their pricing engines to instantly create custom loan quotes based on the detailed information the borrower has provided. Then, the quote is automatically sent back to Zillow where the borrower can view it. With Zillow Quote API, this process can happen almost instantaneously. Glam Media, Inc. has released the Glam Application Platform, a platform that the company says will change the way content and applications are distributed and monetized on the Internet. The Glam Platform removes obstacles that have previously kept applications inside the walled gardens of a few large social networks such as Facebook and MySpace, and enables them to reach over 77 million monthly unique users through contexts such as blogs, magazines, and content web sites coveted by brand advertisers online. To enable new opportunities for publishers, developers, and advertisers, Glam is launching an open-source platform that allows applications to be distributed across the network of premium publishers with a built-in system for monetization. Applications built on the Glam Apps Platform will be available on the Glam Apps Store for embedding or downloading and can be monetized by Brand Ads provided by Glam or by the web developer, media company or agency; or can be with No-Adsâ€”Apps can be free or priced by developers for purchase for use. 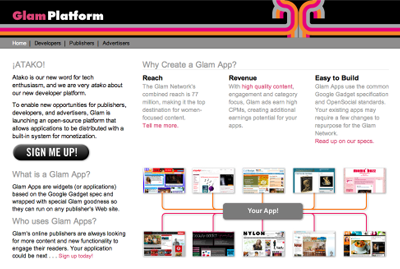 Glam Apps Platform is currently available in private beta to approved developers and select publishers in the Glam Network of more than 600 Glam-owned and operated and independent Web sites, magazine properties, video providers and blogs; the platform will be launched to general availability for developers and web publishers in fall 2008.